Remember Worcester-born, Berlin-based Ryan McLauglin’s Treif Collage paintings at Frieze last year? 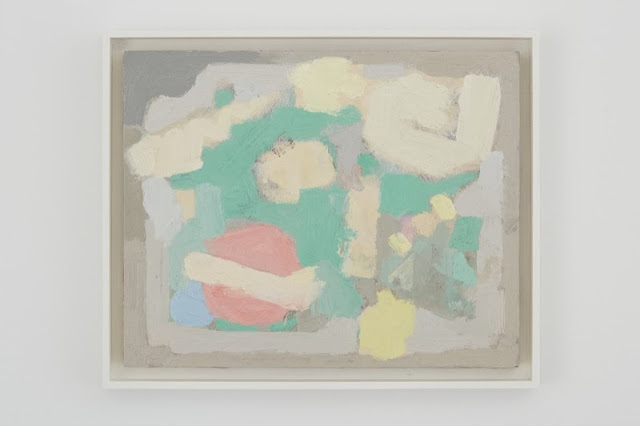 Hovering between still life and abstraction, the charming yet dour small-scale paintings featured a minimal, greyed-down palette and shallow space. In “Raisins,” his solo show at Laurel Gitlen, McLaughlin has moved even closer to abstraction, depicting the flattened space of billboards and advertisements. The palette is brighter and the images look redacted, as though McLaughlin has scraped off more concrete, specific images. The exhibition is accompanied by the following essay, written by Scott C. Weaver, assistant to the head of Museum für Gegenwartskunstco-curator in Basel, which considers painting’s flatness. There was a time when it was widely accepted that the earth was flat. This theory, like so many others, was eventually disproved through centuries of exploration. It was around that time that painters were also grappling with their own kind of flat-ness. And yet, after centuries of exploring its possibilities and limits with depth and perspective—save for the pictorial illusions that may suggest otherwise—painting is indeed still pretty flat. This is not to suggest that painting has somehow failed to live up to its potential nor to insinuate that painting has somehow proved itself unworthy or obsolete. Quite the contrary. How could painting—something that has occupied some of the world’s greatest minds be anything but relevant? For centuries, painters have been the sole purveyors of what you could call a pictorial cultural consciousness. They have singlehandedly trained and developed humankind’s ability to understand pictorial ‘space.’ For centuries painters groomed the human race in preparation for inventions like the photograph, the movie theater, and for the flat screen. If it weren’t for their exploration of the medium, mankind would have no tools to differentiate between the flat world on our iPads and the round earth upon which we live. Ryan McLaughlin, Wasserbetriebe, 2013, oil on canvas on MDF, framed, 25 3/4 x 17 5/8 inches. No, but in all seriousness, Ryan McLaughlin is an increasingly rare species of painter: one with a deep appreciation for all of the painters who have come before him, and one who may—on occasion—have had similar daydreams (see above) about the responsibility that comes with the painter’s profession. 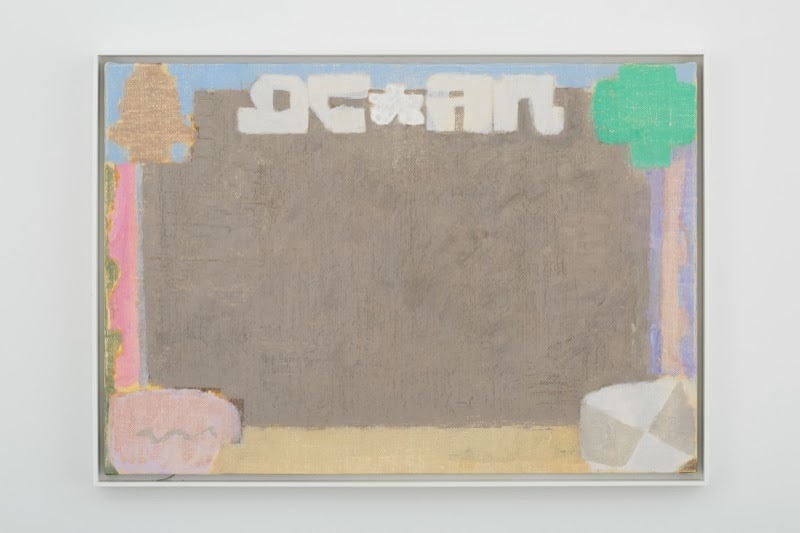 Ryan McLaughlin, Wetter, 2013, oil on linen on MDF, framed, 35 1/2 x 25 3/4 inches. For the exhibition “Raisins” at Laurel Gitlen, McLaughlin has created a group of oil paintings that seem determined to maintain their decidedly “painterly” qualities. These new works, however, have wandered far from the path of more traditional, pictorial depth and resurfaced downstream amidst a more graphic jungle of signage. Having lived in Berlin for many years, much of the imagery that surfaces in McLaughlin’s new series of paintings is very specifically German-oriented. 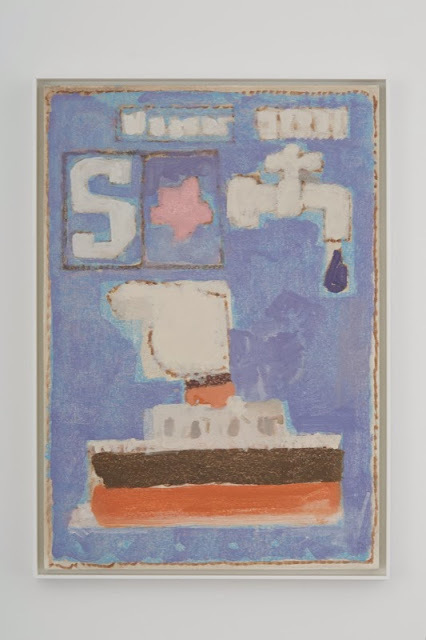 Those who are familiar might recognize certain ubiquitous logos and symbols in McLaughlin’s particular variety of painterly ‘almost-abstractions.’ There is a certain kind of pictorial alchemy that occurs in his paintings. Unlike collage, outlines and shadowless shapes seem to morph into each other. The edge of the painting itself is the only clearly (and decidedly) defined edge at all. The flat graphic elements (some barely discernible) seem to retreat from their own graphic-ness into the (dare I say: appeasedly) flat depth of field—as if they had almost floated to the surface of the painting. 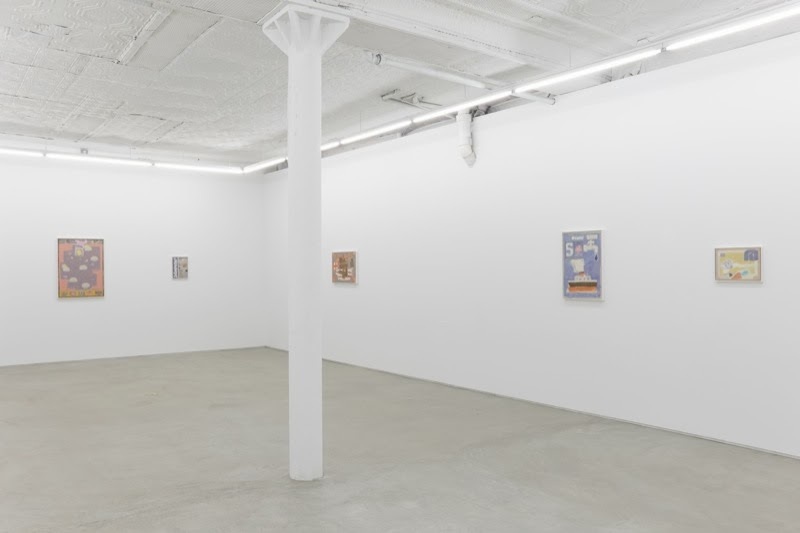 Ryan McLaughlin, installation view @ Laurel Gitlen. McLaughlin’s painting (here a verbal noun) is impeccable—honest, methodical and skilled. Also the command of palette he demonstrates with his controlled, almost earthy tones brings us back to the issue at hand—we are looking at a painting. And isn’t it beautiful? I’m not sure that McLaughlin’s interest in art history and his “deep appreciation for all of the painters who have come before him” are particularly rare, but I enjoy Weaver’s casual writing style, and the notion that painters trained the world to understand pictorial space. The paintings themselves are compelling, too, in a similar, offhand way. Have a virtual look at “Some End of Things,” an interesting group show examining “disharmony, inadvertency, and comedy” that Weaver co-curated this past fall at MGK Basel. 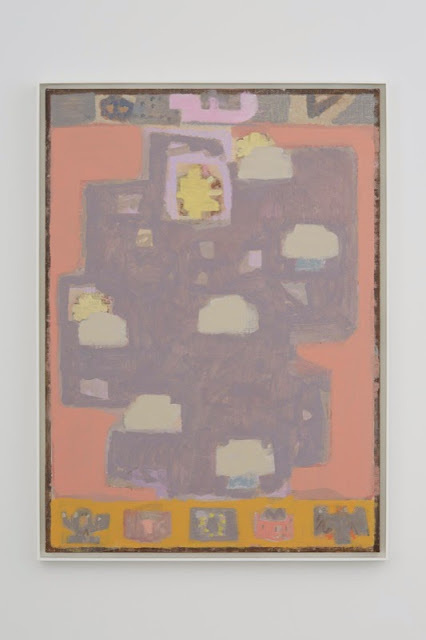 “Ryan McLaughlin: Raisins,” Laurel Gitlen, LES, New York, NY. Through December 22, 2013.